Photograph courtesy Tony Sayer Recently outshopped from Glasgow Works, 25171 stands near the entrance to Eastfield depot on June 5th 1976. The thirteen year career of D7521/25171 saw seven years allocated to LMR depots, then time at WR & ScR depots until its untimely withdrawal. Time between last Classified repair and withdrawal: 28 months. Time between withdrawal & scrapping: 3 months. January 1965 to Nottingham Division (D16). July 1972 to Ebbw Junction (86A). 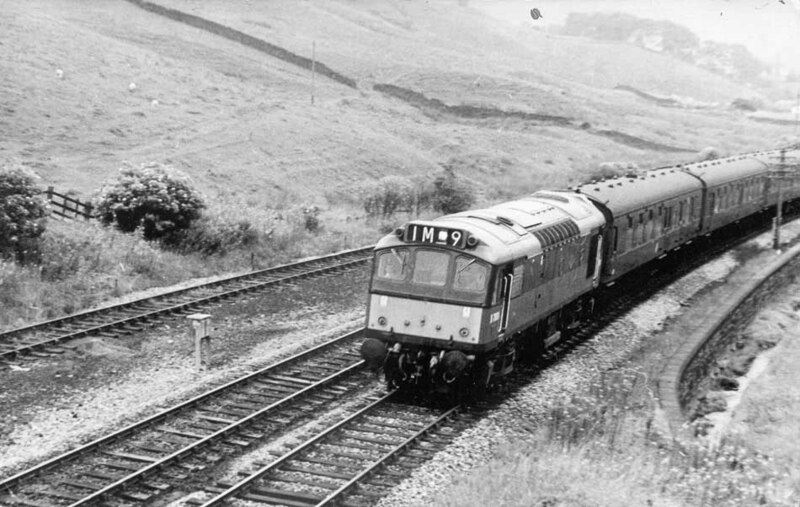 25171 was the 25th Class 25 to be withdrawn, one of three Class 25s retired during October 1978. 25171 was involved in runaway working at Arbroath Goods Yard September 22nd 1978. Broken up at Arbroath by BR staff during January 1979. Noted Derby Works September 1968. Noted Derby Works December 1971. Noted Glasgow Works April 1976. 7521/25171 seems to have generally escaped the spotters notebooks, whether it was for passenger or freight workings. Photograph collection of webmaster Almost brand new D7521 at an unknown location with an inter-regional passenger working. The photograph clearly shows the original location of the engine exhaust port, circular in shape and close to the boiler room. Condition April: two-tone green livery with small yellow warning panels, no blanking plates, hand/footholds present, straight sided sandboxes, three rung bogie mounted footsteps, engine exhaust in original location, bufferbeam mounted steam pipe connection present. On the ex-Great Central line at Blackwell (MP61) by the LMR boundary 7504 & 7521 were noted on track lifting trains the week following closure. Authorities were anxious to remove the re-useable rail prior to the right of way being severed by the construction of the M1 motorway. The Toton Open Day on May 30th 1970 featured 7521 and the Toton 75 ton crane demonstrating the art of how to rerail a locomotive. Condition May: two-tone green livery with full yellow ends, no blanking plates fitted. 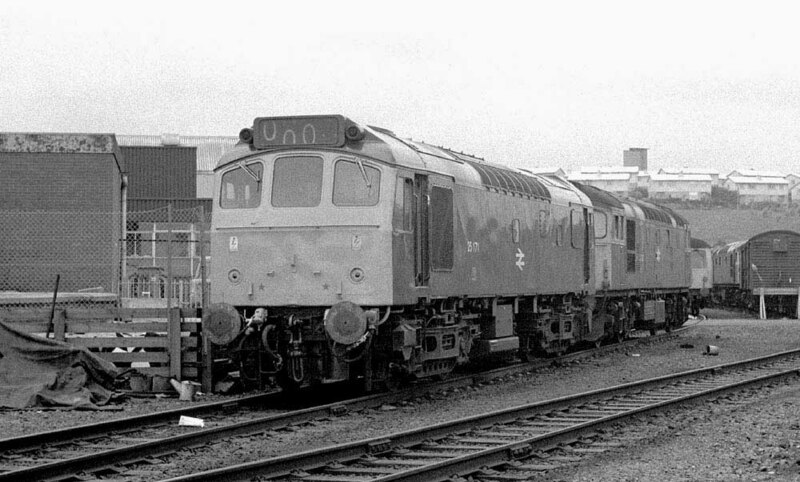 On June 24th 7521 & 7522 worked the Derby - Norwich - Yarmouth - Norwich - Walsall passenger diagram. On December 9th (a Sunday) eight additional freights ran from Margam to Knighton & Toton, three powered by Class 37s, the remainder by Western Region allocated Class 25s. All worked as far as Washwood Heath, returning to the west as light engines or with a freight train. The Class 25s involved were 5209, 7508, 7510, 7513 & 7521. On December 30th the 17.20 Edinburgh - Dundee was formed of locomotive hauled stock with 25171. On the afternoon of August 15th 25171 was noted with a northbound freight at Perth. The last recorded passenger working for 25171 was about a month before its demise, on August 23rd 25171 worked the 06.57 Dundee - Glasgow Queen Street. September 22nd turned out to be the final day for 25171. Whilst hauling a ten wagon ballast train southbound at Arbroath the train ran out of control and was diverted into the goods yard since both main lines were occupied. It demolished the buffer stops and impacted the retaining wall causing major structural damage to the locomotive, not helped by two of the now derailed ballast wagons demolishing the rear of 25171. The guard and driver’s assistant jumped to safety, the driver taking refuge in the engine room. The No.2 end was leading, with the cab being crushed, the leading bogie was derailed. The No.1 cab was pushed upwards and crushed after being hit by the leading bogie ballast wagon, the second ballast wagon had slid under the leading wagon and been crushed. It is reported the engine was still idling after the collision had occurred. Condition Final: blue/yellow livery, blanking plates fitted, hand/footholds plated over, three-rung bogie mounted footsteps, sandbox styles appear mixed. During November 2016 a builder's plate from 25171 sold for GBP395.00 on ebay. Not all passenger workings are recorded on this page. Page added January 28th 2013. Last updated April 22nd 2019.